Our commitment to dosage form innovation goes beyond the supply of capsules. Capsugel can help formulators and R&D teams with a broad array of support spanning Consumer Health and Nutrition product formulations based on decades of experience with both health & nutrition and biopharmaceutical science formulations. Capsugel formulators are fully equipped with advanced laboratory-scale equipment and tools and specialized methodologies for accelerated feasibility assessment, compatibility and development. 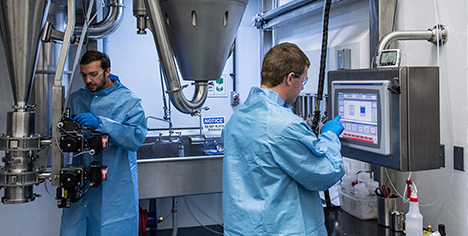 Quality Engineering Services are available to provide training and consultation with powder formulations to help optimize performance on all brands of capsule filling machines. Special Capsugel University programs and in-house manufacturing training is available to all Capsugel customers. In need of formulation support?